The first fully calibrated images from the European Space Agency's Smos satellite have now been released. The spacecraft's new pictures show swathes of Scandinavia, Australia and the Amazon. 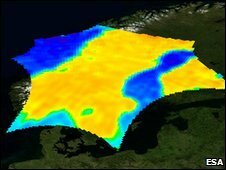 The maps record the amount of moisture held in soils and of the quantity of salts dissolved in seawater. The mission's data is expected to have wide uses but should improve weather forecasts and warnings of extreme events, such as floods. 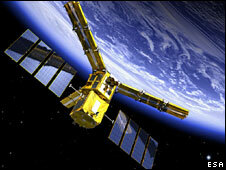 Smos was launched on 2 November. It carries a single instrument - an interferometric radiometer called Miras. Some eight metres across, it has the look of helicopter rotor blades. Miras measures changes in the wetness of the land and in the salinity of ocean water by observing variations in the natural microwave emission coming up off the surface of the planet. To do this, the instrument has 69 antennas positioned on a central structure and along the lengths of its three arms. The signals received by the different antennas are combined to produce a single image. This interferometric technique has been borrowed from radio astronomy, and has allowed Miras to mimic a much larger single antenna than could have been launched into space on Smos's rocket. The instrument produces a snapshot of temperature brightness every 1.2 seconds. The image of Scandinavia shows one snapshot acquired by Smos. Generally speaking, the "colder" (blue) the "temperature brightness" of the microwave signal, the saltier the water and the wetter the soil. Ocean water naturally shows up as very blue. One key problem scientists have been grappling with is interference. Although the L-band (21cm) spectrum in which Smos operates is supposed to be protected, the team has discovered many spurious signals, particularly over China, western Russia and parts of Europe. This has required the team to tune its reconstruction algorithm in order to clean up the images. 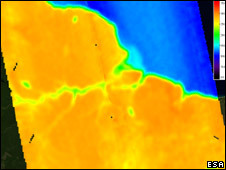 "We have focused the processing as we now have more definite characteristics of the instrument, so there is less 'smearing' and the pollution is reduced," explained Dr Yann Kerr, a lead investigator on the mission from the Centre for the Study of the Biosphere from Space (Cesbio), Toulouse, France. "But data is still lost on some affected areas. We are working on ways to reduce the impact; that is to limit it to the actual emitter," he told BBC News. "The main source of interference is apparently linked to nations (i.e. only some countries are affected), and is coming from either (poorly designed) beacons for maritime navigation or from military radars (early-warning systems for instance). "All the areas causing problems at the beginning are still giving problems." Limiting the impact of this interference is just one of a number of processing exercises that have to be undertaken to give the scientific community usable data. Nonetheless, Dr Kerr declared himself extremely happy with the way the mission was progressing. "Finally, our field campaign is going great!" he said. Smos information will result in a better understanding of the hydrological cycle - the description of how water is constantly exchanged between the Earth's land and ocean surfaces and the atmosphere. The satellite is expected to help improve short and medium-term weather forecasts, and also have practical applications in areas such as agriculture and water resource management. In addition, climate models should benefit from having a more precise picture of the scale and speed of movement of water in the different components of the hydrological cycle. The satellite is part of Esa's Earth Explorer programme - eight spacecraft that will acquire data on issues of pressing environmental concern. 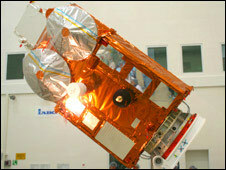 The first - a gravity satellite called Goce - launched in early 2009. The third in the series is called Cryosat-2 and will launch in the coming weeks. It will assess the state of the world's ice cover.